Because layover time just seems like an ETERNITY. Not unlike standing in line at the DMV or sitting at the dentist awaiting a root canal, being stuck at an airport can be akin to torture. But as it turns out, hanging out at the airport can go beyond merely tolerable to thoroughly pleasant and entertaining. At these international hubs of travel, there are a variety of unique activities to engage in while you wait for your ride, and we’re not just talking about free WiFi. Check out all the offerings you can do all over the world, from hitting the racks with a personal shopper to soaking in some hot springs. Who says the journey won’t be almost as enjoyable as the destination? Of course, a city so focused on wellness like San Francisco would dedicate a place at its airport to practice your Bhujangasana. The Yoga Room in Terminal Two of the San Francisco International Airport is a unique space for the sole purpose of relaxation, self-reflection, and practicing yoga (free of charge) — all things that make flying way less stressful. LAX is no stranger to celebs, A-listers, and frequent travelers, and The Private Suite has created a fittingly luxurious escape from all the standard stresses of airport travel. Members have their own suite away from the main terminals, complete with snacks, a bathroom, a daybed, a TV, and a designated team of eight people. Once they’re ready to board, they go through private TSA security and are chauffeured across the tarmac directly to their plane. Anyone can be a member as long as you have the bankroll — annual membership is $4,500, with a $2,700 and $3,000 fee for domestic and international flights, respectively (for up to three guests). So many of us have bouts of stress and anxiety at the airport (how could you not?). To help with this all-too-popular feeling, LAX has debuted Pets Unstressing Passengers (or PUP). Trained therapy dogs (and their trusty handlers) stroll the departure levels of the airport to provide comfort to those waiting for flights — a sweet and sensible way to calm most anxious travelers down. When at the Hamad International Airport, why laze by the gate when instead you could visit the Vitality Wellbeing & Fitness Centre? For an entrance fee of around $48, you get access to a variety of recreational spaces, such as an indoor swimming pool, hydrotherapy tub, and a full gym. For an extra charge, you can hit the squash courts (racquets, balls, and shoes provided) or book an anti-jet-lag massage or a rejuvenating facial. 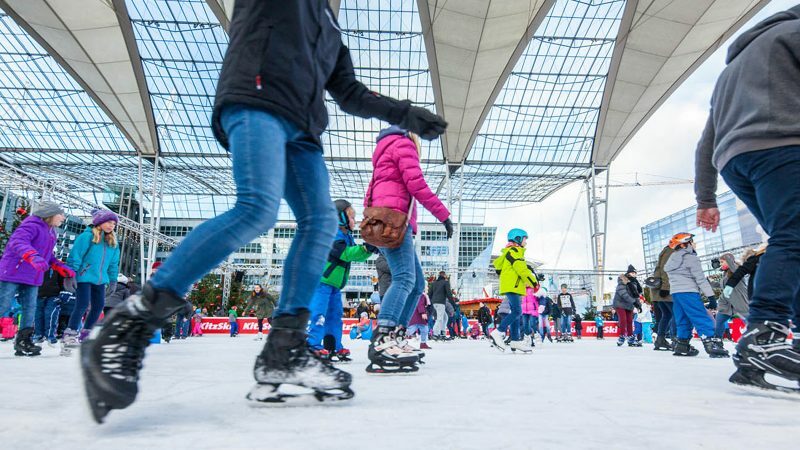 Every winter, the Munich International Airport sets up a huge Christmas market in the covered space connecting the two main terminals. There is a towering Christmas tree, an ice rink, live music, and local treats. You may want to head to the airport extra early to leave enough shopping/leisure time. It’s totally logical that the Germans would offer beer-centric entertainment at their airports. The aptly named Airbräu brews ales right there in the terminal. They also host brewery tours for an in-depth look at how they make their FliegerQuell, Kumulus, and their new Pilsner named Jetstream. While you can catch the hottest new flick in airport movie theaters in the Minneapolis-St. Paul Airport, Singapore’s Changi Airport, and South Korea’s Incheon Airport (to name just a few), the Hong Kong International Airport boasts a 350-person IMAX theater and the largest IMAX screen in all of Hong Kong. Watching a movie on a massive state-of-the-art screen is a far better way to get your entertainment than watching something on your phone (#truth). Before you fly into the sky, set aside a moment to sit, eat, and take in our galaxy at Tokyo’s Haneda Airport. Their Planetarium Starry Café allows diners to enjoy 40,000,000 stars overhead while feasting on a bowl of pasta or sipping on a cup of hot coffee. An out-of-this-world dining experience for sure. It doesn’t matter whether you’re still a kid: Everyone is welcome at Hello Kitty Happy Flight in northern Japan’s New Chitose Airport. The Sanrio-centric center includes adorable photo ops, a huge gift store, a café with Hello Kitty-themed treats, and a playground for little ones. Badtz-Maru, My Melody, and many, many more are included in the travel inspired areas, representing world destinations from New York City to Greece. Admission is about $7 for adults and $3 for children. If you’d like to say hello to a spa instead of hello to a kitty, New Chitose also features a sprawling, full-service onsen. Along with the indoor and outdoor hot springs that define the onsen experience (with waters coming directly from the source), they offer relaxation chairs, guest rooms, massages, and a traditional restaurant serving up seasonal cuisine. The adult admission fee is about $14 (includes bath fee, bathrobes, and towels), and the hot springs, rock sauna, and the various treatments cost extra. How much shopping is available at Heathrow International Airport in London? So much so that they can offer personal shopping services. When suffering from jetlag, having a trained personal shopper to help you navigate through stores like Dior, Dolce & Gabbana, and Stella McCartney would be rather handy. This post was originally published on Brit + Co.